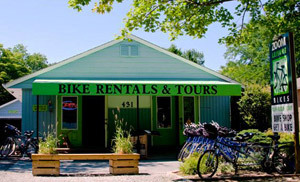 Niagara-on-the-Lake is at the trailhead of the Niagara River Recreation Trail, a 56 km bicycle path that runs parallel to the Niagara Parkway through Niagara Falls and on to Fort Erie's beaches and links up with the 140 km Greater Niagara Cycle route. The trail passes many historic sights and tourist attractions such as wineries, the Butterfly Conservatory, the Niagara Botanical Gardens, the Whirlpool and the world famous cataracts themselves. See Niagara as you've never seen it before on what Winston Churchill called, "the prettiest Sunday afternoon ride in the world". 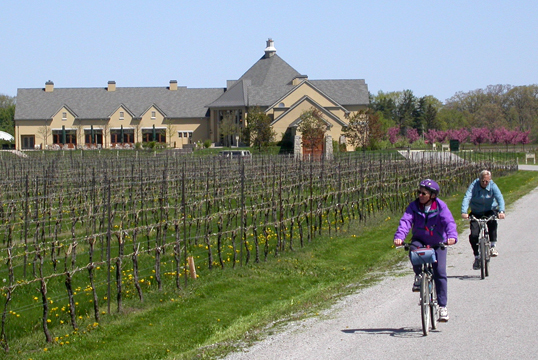 Niagara-on-the-Lake is the perfect place for a relaxing, easy-paced summer getaway. Recognized as North America's best preserved 19th century small town, it will captivate you with a multitude of attractions such as historic Fort George, Shaw Festival Theater, with its three theatres, the upscale shopping along Queen Street, golf courses, endless parks, and our celebrated Niagara wineries and craft breweries. Relax with a carriage ride through the Historic Old Town, thrill to a Jet Boat up the Niagara River, or simply soak up the antique shop ambiance on a stroll along some of the most charming streets you'll find anywhere. Get pampered in one of our fine hotels or meet our citizens in a cozy Bed and Breakfast home; dine in one of our award-winning restaurants, and just for a little while, live the good life in beautiful Niagara-on-the-Lake!